With the Windows end-of-service deadline finally upon us, a lot of holdouts are hurriedly making the upgrade to Windows 7 or 8. Moving all your important files from Windows XP to your new computer may sound like just one more hassle. Fortunately, it doesn’t have to be that hard at all. Here are four simple options for transferring your data from Windows XP to a new PC without breaking a sweat. The most straightforward way to transfer your data to a new computer is by manually moving it from one PC to the next using removable physical storage, like a flash drive or external USB hard drive. The upside to this option is that you don’t have to download any software or go through any special steps. Just plug your external drive into your old computer, drag your files over, and then plug it into the new computer and drag the files back. There are two caveats, though. The first is that you’ll actually need enough physical storage to make the transfer. If the only external storage you have is a 512MB flash drive you got at a Circuit City in 2007, it’s not going to be practical for transferring large amounts of data. Fortunately, external storage has gotten quite cheap. You can get a reliable, brand name 500GB external hard drive for $70 on Amazon or Newegg. Not only will it help with the data transfer, but you’ll be able to use it to back up your important files in the future. 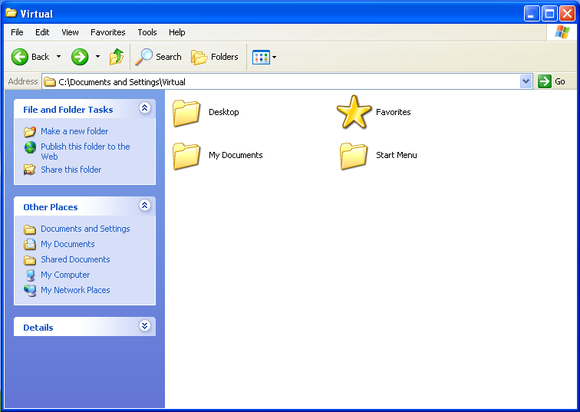 Windows XP's Documents and Settings folder. The other issue is that you’ll have to manually select the files to transfer. If you’ve been allowing your software to save files in the default location, then all of your important documents and files should be located in C:/Documents and Settings on your Windows XP computer. Here, you’ll find each user’s My Documents folder, which is the default location where Microsoft Office and most other software applications store documents. You’ll also find the Desktop folder, which contains all the files you’ve dropped onto your computer’s desktop. Copy over all the contents of C:/Documents and Settings to your external media. Then, on your new Windows computer, move the files to the appropriate folders in C:/Users, which contains the My Documents and Desktop folders in Windows Vista, 7 and 8. If you haven’t been saving all your documents to the My Documents folder or one of its subfolders (and this, incidentally, is why you generally should), you’ll simply have to search out the files that are important to you using Windows File Explorer. The power of the cloud can shift your data from a Windows XP PC to a new machine. If you don’t want to invest in an external hard drive, you can also transfer data with a cloud storage service such as Dropbox. This can be a convenient way to transfer documents, but be aware that transferring large files (such as home movies) over a cloud-storage service can take a long time and eat into your monthly broadband cap, if you have one. Beyond that, free cloud services tend to offer small 5GB to 10GB storage limits, which may not be enough storage to handle all the data you want to transfer. Paying for additional cloud storage can overcome that hurdle, however. You can even piece together 50GB to 100GB of free cloud storage, if you don't mind creating accounts with several companies and putting in a little sweat equity. A cloud service also requires that you manually pick the files to move over. If you’re not comfortable deciding which files to transfer, you might find one of the following two automatic file-transfer applications helpful. Now onto the more automated options. Windows 7 and 8 come with a built-in tool for transferring user data from one Windows PC to another, called the Windows Easy Transfer tool. This application basically does what we described in the previous section—transferring the contents of the Users folder—for you, and also transfers over your user accounts and settings, unlike the previous options. It’s included in Windows 8 and 7, but you’ll have to download it for the Windows XP computer. Using Windows Easy Transfer on a Windows XP machine. 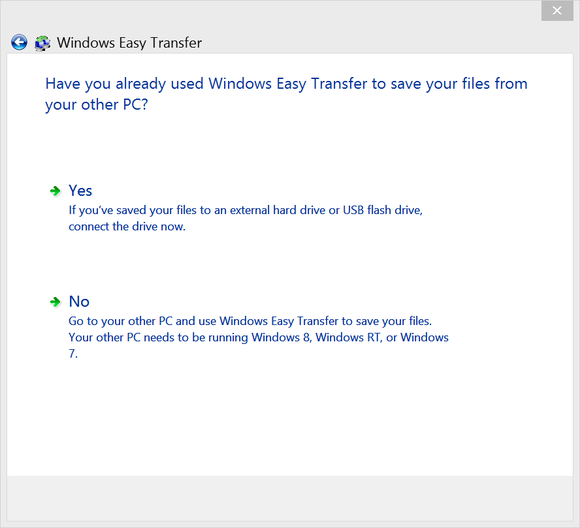 Once you’ve downloaded the file and installed it, just run “Windows Easy Transfer Tool for Windows 7” on your Windows XP computer and walk through the steps. Choose “An external hard drive or USB flash drive” when asked where you want to save the data, and then wait while the application scans your system. You’re given the option to password-protect your files, if you like, then asked where to save the file that contains all the data to be transferred. Choose to save it to your external hard drive, or to a cloud storage service. 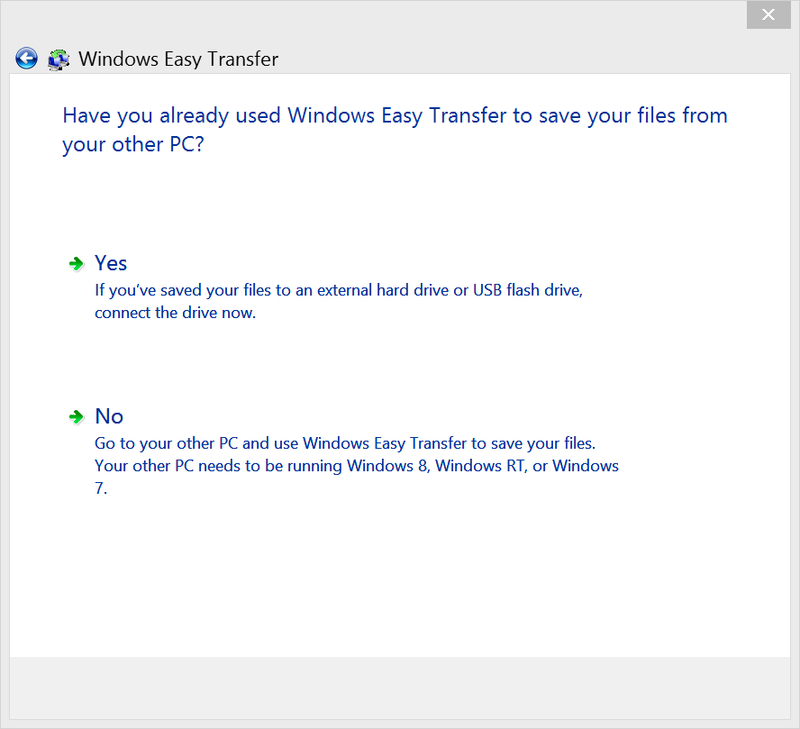 Using Windows Easy Transfer to transfer XP data to a Windows 8 PC. On your Windows 7 or 8 computer, just open the Start Menu or Start Screen (respectively) and type “Windows Easy Transfer,” then click on the utility application with that name. Click next, then click on the button marked “Yes.” This will allow you to navigate to the file you saved on your external hard drive or cloud storage folder. The Easy transfer tool will automatically transfer over documents, bookmarks, and other User data. 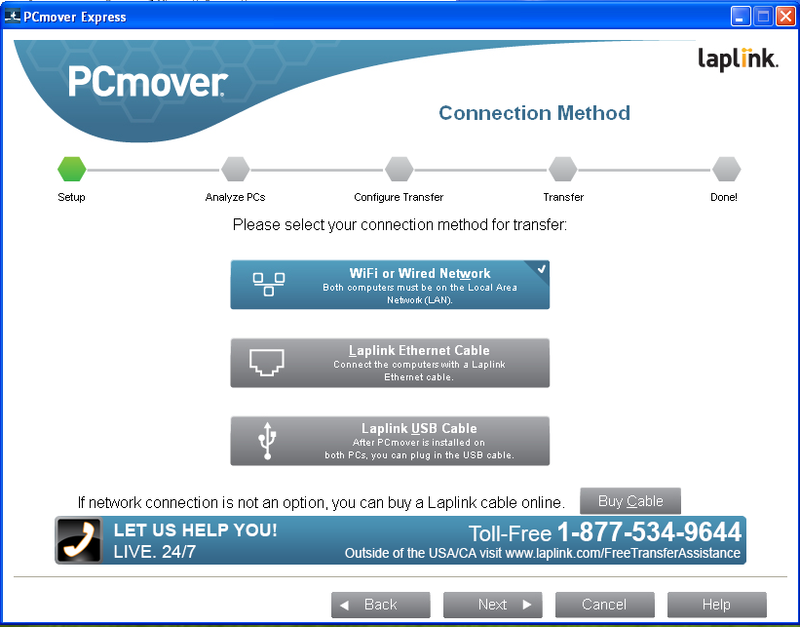 Microsoft is currently offering a free version of Laplink PCMover Express for users transferring from Windows XP. PCMover Express offers basically the same data- and settings-shifting functionality as the Easy Transfer Tool, but instead of storing the files to be transferred on a removable drive, it sends them directly from one computer to the other across a local network using Wi-Fi, ethernet, or USB. 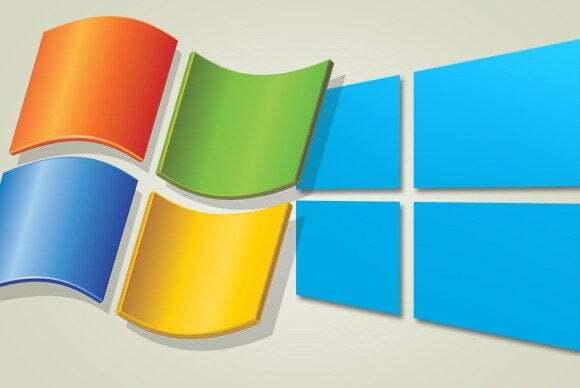 Microsoft's offering Laplink's easy-peasy PCMover Express software to Windows XP users. You simply download the program and then install it on both computers. Run it on the XP machine, and select Wi-Fi or Wired Network from the options given. Do the same on the new PC. As long as the two are on the same network, PCMover Express will be able to transfer your documents, user info, and settings directly from one to the other. Don't forget your product keys! There’s one last thing to think about before you shut down that old PC for good: product keys. If you’ve activated paid software on your old computer, you should make sure to recover those software keys before they’re gone for good. That way, you can download and reactivate the software on your new PC, even if you’ve lost the original packaging, without having to buy a new copy or contact the manufacturer. To track down almost all of the CD keys on your new system, you can use a free program called Belarc Advisor. It will find all the CD keys in use on your machine, and save them for you in a convenient HTML document. After installing the program, it runs with almost no input from you. After a few seconds it’ll spit out a document with an incredibly thorough breakdown of all the software, drivers and hardware that make up your computer. About two-thirds of the way down the document you’ll see a list of all the software keys Belarc Advisor could find on your system and their associated programs. Save or even print out Belarc Advisor's HTML file so you can re-install your software on your new computer. Most software doesn’t require you to deactive it on your old computer before you can activate it on a new computer, but some do. In particular, some professional-grade software, like Adobe Photoshop, requires deactivation before it can be installed again. A host of tools and techniques stand ready to help you migrate from your old PC to a new one. We know it's hard to say goodbye, but take a deep breath, set aside some time, and do it.